The Japanese style of craft is all the rage, just take a look on Etsy and you'll see it everywhere. It's about simple clean lines that showcase the fabric itself. 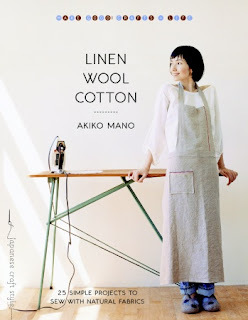 Akiko Mano shares her love of natural fibers in Linen Wool Cotton. Growing up, her parents owned a clothing factory. Akiko was surrounded by fabric in fabulous colours but she was drawn to the natural fabrics in neutral colours. I was impressed by the projects in this book. There are 25. They look fairly straight forward. The photography is lovely and the model used is adorable. I just want to put her in my pocket. The overall impression I get is of comfort. Even the writing is very relaxed. Akiko writes essays that appear throughout the book. Now, I had to try out a project before posting my review and I had mixed results. I choose one of the more challenging projects- I always take on more than I should- the Slouch Bag. I went on the hunt for linen and I did find a nice black bolt at my fabric store. The first issue I had when I got home was that I didn't have quite enough and I had to sacrifice some length in the bag. Since I had to convert from inches to centimeters, there might have been some loss there. Next time I'll err on the side of caution and buy a bit more. Things went well until I got to the handles. I couldn't figure out the instructions. *** This is a translation and something might have been lost along the way. I just improvised and did it my own way. I probably should have started with the handkerchief though. However, I'm not deterred. I can't wait to try another. This book is part of a series called Make Good: Crafts + Life. A future installment is Carefree Clothes for Girls. Really looking forward to that! *** Morag pointed out that the pattern does indeed contain an error and a correction can be found at www.makegoodbooks.com. Thanks to Random House Canada for the copy. Improvisation or not, I think that bag is adorable! As someone who barely knows how to sew a button back on her shirt, I totally admire anyone who can make their own handbag. I love your bag. It looks wonderful. I carry something similar to the one you made. I can't tell at all that you improvised. Of course I wouldn't be able to make a bag like that one either. I too think your bag came out really nice!! Wow that's a gorgeous bag! This book looks really great, I've always loved clothes made from all-natural fabrics. I'm so impressed that you even tried. We had to make tote bags in home ec in junior high - I think I was the only one who got a bad grade on it. I think you did great! I've always wanted to sew bags and clothes but always failed, so maybe this is the book for me. I'll have to check it out, thanks! JS- Thanks! I really like the Japanese style. It's very peaceful. Nicole- Thanks. Every bag I own has to be huge! Joanne- It's a really nice looking book. Bermuda- lol! I wasn't the greatest sewer in home ec either. I put in pockets upside down once. Kris- Keep trying! I use my seam ripper quite often. I'm impressed with the bag you made. Something like that is totally outside of the range of possibility for me, so I really admire those who can create stuff like that. How cute! I love it! OH,a and the book is great too. I'm so in love with Japanese literature, and now this lovely book which showcases their style is all the more exciting. Thanks for sharing; don't you just want to put on the outfit she's wearing on the cover? Bethany- Thanks! You made me want to make the lunch bags. Bellezza- Adorable isn't it? The apron is in the book. I showed it to my mom and she loved it! Thanks for dropped by Karen! I am to the handles and the directions are just wrong. I am sure I can figure it out, but I think there should be a place for errata on the publisher website. If I was reviewing it, I would have to mention this. Fiber- I'm not the best at reading instructions so that's why I mentioned it. If you had the same trouble, it could be that they are wrong. Hopefully, this will be caught before the next printing. The directions for the slouch bag handle are definitely wrong. They're still pretty simple if you have some experience and think it through. Hopefully the next edition will catch the error. After re-working the handles, I love my bag! What We Need- Glad it's not just me! I went over it and over it, finally just decided to do it my way. I also bought and LOVE this book. I love it so much i went to the website www.makegoodbooks.com and found that there is an error in the printing for the Slouch Bag. It's to bad that you didn't know about it but i think you did an amazing job on the bag anyway. Morag- Thanks so much for pointing that out! I'll add that to my review.